Ant bites are one of the most common insect bites in the world. Almost everyone has been bitten by an ant at some point of their lives. But why would an ant bite? How can we identify ant bites and how should we treat them? Why Would an Ant Bite? An ant will bite for only one reason, and that is because it feels threatened or it feels that it needs to defend itself or its home. Ants are actually social insects which live in colonies where everyone knows what they are supposed to do and everyone strives to follow the rules, boundaries and limitations. Part of those parameters is knowing when to defend the self or the colony. When an ant is squashed, it releases a chemical signal to other ants that it has been attacked. Since ants protect each other, the self, and the colony, an attack to a single ant will be seen by the whole colony as an attack towards all of them, hence triggering them to become defensive. What Happens When an Ant Bites? When an ant bites, they make a cut into the skin with their pincers. Some species of ants will inject venom. A genus of ants, those belonging to the genus Crematogaster, will spray enemies with a substance which is primarily composed of formic acid (formalin). Because venoms and sprays are substances which are used for defense, they can cause irritation of the skin and, in some cases, even a severe allergic reaction. A bite from an ant can trigger either a local reaction or a more severe allergic reaction in some individuals. It is highly important to know how to differentiate between the common local ant bite reaction and the more serious allergic reaction to know what treatment should be given to the bitten individual. Treatment of ant bites is relatively easy, unless there are hundreds of bites on the bitten individual. Follow the steps in the following table to successfully treat bites from ants. 2. Apply a soothing ointment to the area of the bite. Aloe vera, calamine lotion, baking soda paste, or a cortisone cream will help control the itching and the swelling. 3. Keep the bitten area clean. 4. Resist scratching the bitten area to prevent infection. 5. Observe for other signs and symptoms until the bite is healed. It usually just takes 48-72 hours for the bite to fully heal. 2. Give Benadryl or antihistamines for a minor allergic reaction.3. Give epinephrine for a more severe allergic reaction (with difficulty of breathing or changes in the breathing pattern).4. Note what type of ant inflicted the bite. Fire ants will always cause severe reactions. 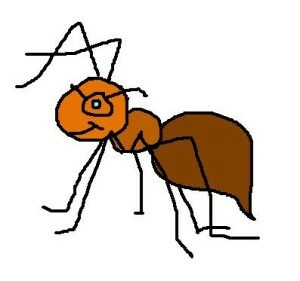 The fire ant is known for the power of its bite.5. Seek immediate medical attention as soon as possible. Avoid disrupting lines of ants with your foot, hand or finger. If an ant gets to you, shake it off or get rid of it by a flicking motion. Ant bites are common, but some ants can inflict a bite which should be taken seriously, especially for hypersensitive individuals. Knowing what to do to prevent an ant bite is the best way to deal with ant bites.